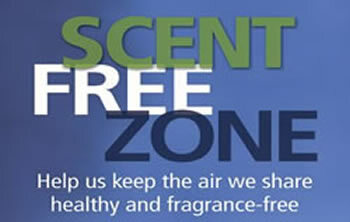 We’re Scent-Free! Did you know that perfume is made of toxic chemicals that can be detrimental to your health? Many of the chemicals in perfume are the same chemicals in cigarette smoke, and yet there is no regulation of the fragrance industry. Perfume today is not made from flowers, but from chemicals. More than 4000 chemicals are used in fragrances. Of these 95% are made from petroleum. Many of us are bothered by perfumes; causing headaches, sinus problems, and even provoking asthma. Other affects may include exhaustion, weakness, dizziness, difficulty concentrating, rashes, muscle ache, nausea, and stomach cramps. Many of us get sick from wearing or being exposed to it. The result here at school is that learning and health are affected. Park West School is a scent-aware environment. Parents and students: please do not wear perfumes, colognes, and heavily scented products to school.